With Arndale Octa already shipping, and the upcoming ODROID-XU2, we already have two low cost boards with Samsung Exynos 5420 big.LITTLE processor for less than $200. But if you want a more complete kit, HOWCHIP 5420-DVK with a 4.65″ OLED display and capacitive touchscreen, 2GB RAM, 4GB eMMC, and various connectors, could be an option. There’s also a Lite version without the OLED display. 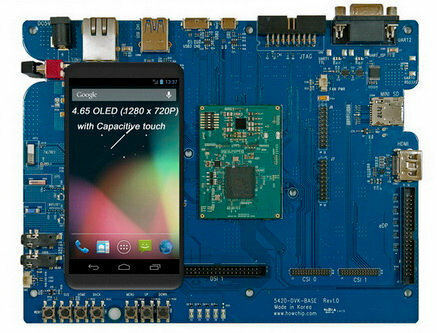 SoC – Samsung Exynos 5420 Octa with 4x ARM Cortex A15, and 4x ARM Cortex A7 in big.LITTLE configuration, with Mali-T628 GPU. Display – 4.65″ OLED (1280×720) with touch screen, connected to MIPI DSI interface. The company provides binaries and source code for u-boot 2010.12, Linux kernel 3.0.x, and Android 4.2.x Jelly Bean. The reference schematics will also be provided. HOWCHIP 5420-DVK Lite kit is exactly the same minus the OLED display. The full kit will sell for $499, the Lite version for $299. The board is now ready for production, and shipment is scheduled by late June. There’s no pre-order option on the product page, but the company asks people who intend to purchase to contact them via email before the 15th of May. On a separate note, I’ve also noticed HOWCHIP 5420-EMM, an eMMC 5.0 Test/Evaluation platform also powered by Exynos 5420 features an eMMC socket, and with specs very similar to 5420-DVK Lite. Pricing and availability are not available for this board.